“I am proud to be associated with such a professional and cutting-edge marketing team. I am also proud to have our company honored among fortune 100 and 500 companies in the Charlotte market. We have only just begun!” said Executive Vice President & Chief Development Officer Blake Martin. Kim Howard is one of the people we support who shared her story on camera and accompanied the marketing and communications team to accept the award at the banquet. “I hope that by telling people how Monarch helped me, more people reach out because Monarch saved my life,” said Howard, who received services from Monarch after suffering a traumatic brain injury after a car accident. The “HEROES” marketing campaign was a partnership with the creative agency, A Big Idea Group, and all four videos from the “HEROES” campaign can be viewed on monarchfilms.monarchnc.org. To view the complete list of categories and winners for the 2018 Queen City PR Awards, click here. 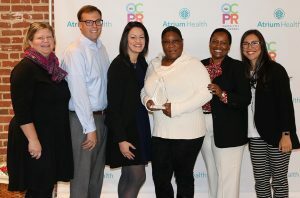 Pictured from l to r: Director of Philanthropy, Laurie Weaver; Executive Vice President & Chief Development Officer, Blake Martin; Communications Manager, Nathalie Santa Maria; person supported, Kim Howard; Vice President, Marketing & Communications, Natasha Suber; and Senior Community Outreach Manager, Yesenia Mueller.